Portrait of Henry Bird Calfee. The following H. B. Calfee biography was taken from Lee H. Whittlesey’s article, "Everyone Can Understand a Picture": Photographers and the Promotion of Early Yellowstone. It appeared in Montana, The Magazine of Western History, Summer 1999 issue. Henry Bird Calfee (1847-1912) and his partner Nelson Catlin are generally mentioned together when Montana photographers are the subject. The two men ran a photographic business in Bozeman during the early 1870s. Issues of the Bozeman Times for 1874-78 constantly mentioned the two men as photo shop owners, and at one point Calfee was said by the newspaper to have moved to Radersburg, Montana. 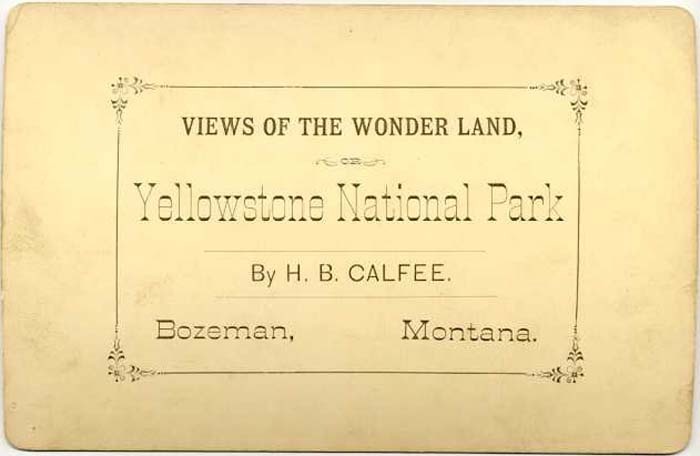 By his own account, Calfee came to Montana Territory in 1870 and visited Yellowstone as early as 1871, when he stated that his fellow traveler Macon Josey fell into a Yellowstone hot spring. 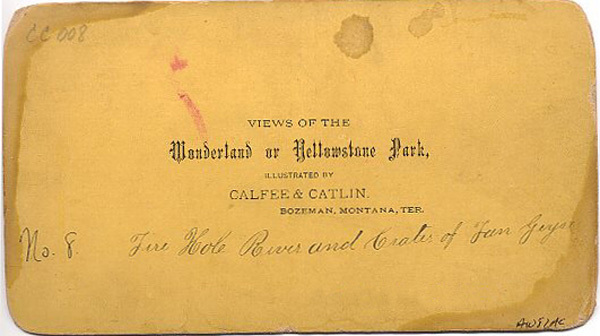 Thereafter, Calfee was mentioned in numerous 1870s Yellowstone accounts as constantly being in the Park taking pictures. Montana pioneer W.E. Sanders met him in 1880 at Old Faithful, and Calfee told him that he (Calfee) had been in the park photographing it every year for nine seasons. Hence, Calfee must have begun taking Yellowstone Park photos in 1872, if not 1871. 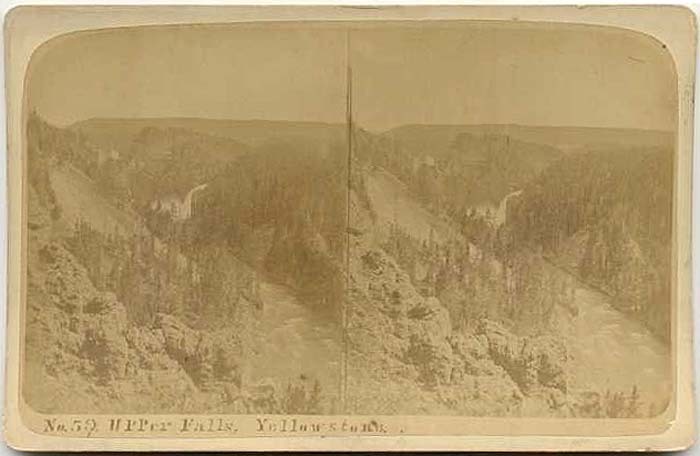 While in the Park every summer during the 1870s and early 1880s, Calfee took at least 295 photos of Yellowstone and figured into some early park history. So continually present was he in Yellowstone Park each summer during the 1870s that he was in place to convey Mrs. Cowan and her party to the safety of Bozeman following their ordeal with the Nez Perce Indians in 1877. In 1879, he and Catlin played a minor role in the naming of Lone Star Geyser, and took photos of a "sagebrusher" party. 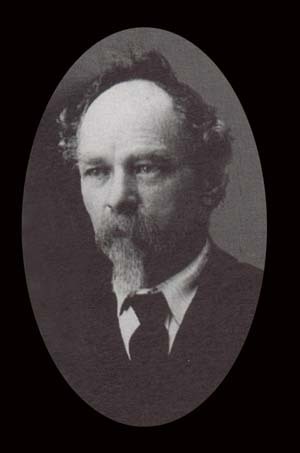 In 1880, Park superintendent P.W. Norris named a stream in Yellowstone Calfee Creek for Calfee who was accompanying Norris's party that year. 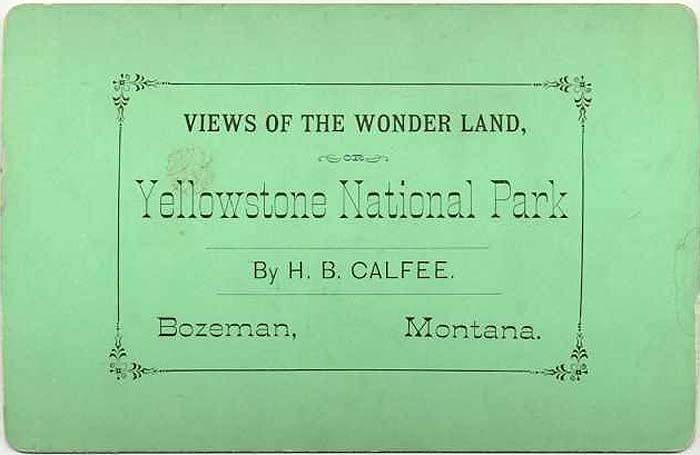 During the period 1881-82, Calfee went on a lecture tour to promote Yellowstone Park with W.W. Wylie which was mentioned frequently in the Bozeman Avant Courier newspaper. Woodcuts made from Calfee's photos graced Wylie's 1882 park guidebook entitled Yellowstone National Park, Or The Great American Wonderland. An incomplete set of Calfee's stereo photos survives at the Montana Historical Society. Likewise, the Yellowstone Park historic photo collection and several known private collections all contain a number of Calfee stereo views. 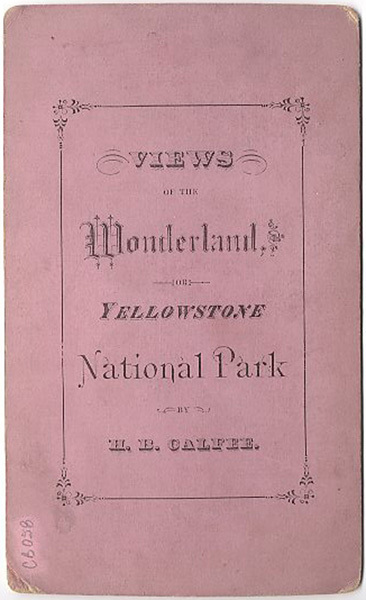 From these we know that the series reached as high as number 275 and was called "The Enchanted Land or Wonders of the Yellowstone National Park by H.B. Calfee." Calfee's stereo views indicate that he was probably even responsible for several park place-names, among them Demon's Cave, Pulpit Basins, and Fairies' Fall, as he searched for captions for his photos. Calfee was very interested in the park's geysers, apparently more for their photographic potential than because he was a budding "geyser gazer" (person with a passion for geysers). He went so far as to set up his traveling studio in the Upper Basin and there to sell his photos directly to travelers (one of his photos shows this "store" with Calfee's signs proclaiming "Views of the Wonderland" for sale). And Calfee began predicting the eruption times of some geysers, an interpretive activity in itself, probably to help sell his photos. He did this particularly at Giant Geyser, for traveler Wilbur Sanders ran into Calfee there in 1881, and posed with his party for one of Calfee's photos. Said Sanders: "Calfee expected the Giant to spout today and nearly everybody in the Basin was lounging around it 'from early morn to dewy eve', awaiting its [200-foot high] action." Much less is known of Calfee's partner Nelson Catlin except that his name appears on many Calfee stereoviews. 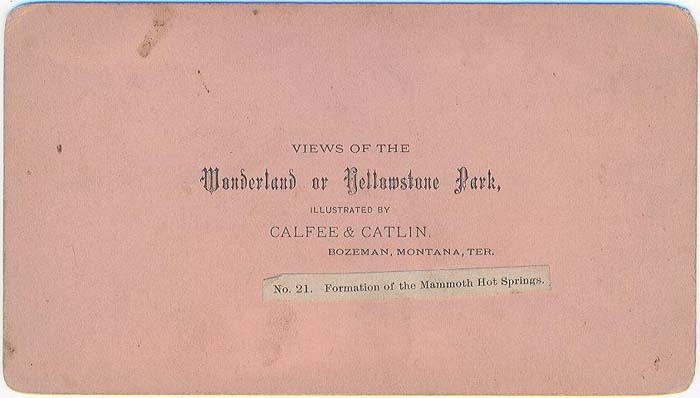 These were printed with the squib "Calfee and Catlin" on them and were part of their series known as "Views of the Wonderland or Yellowstone Park." The numbers in this series reach at least to 148. 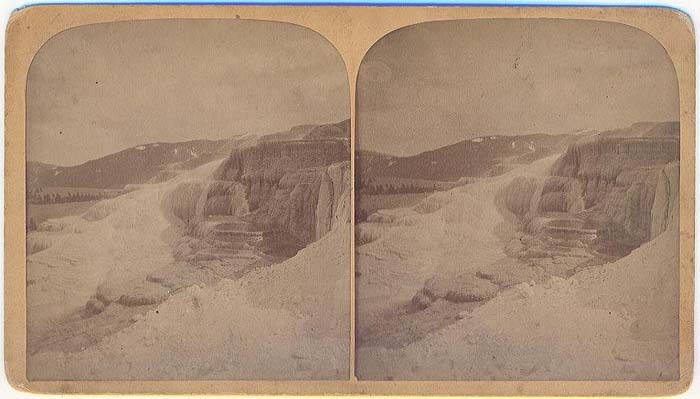 Like those of Calfee and Crissman individually, Catlin stereographs represent treasures of early Yellowstone days. It is not known whether or not Catlin produced any views bearing his own name alone. 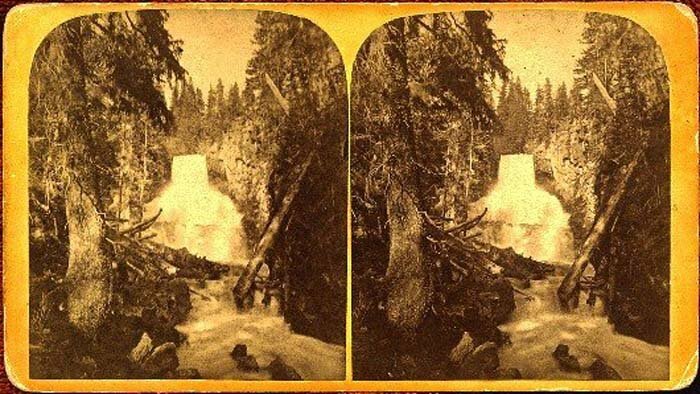 An analysis of Calfee’s stereoview history reveals that he issued at least two series of Yellowstone views. These series were reprinted in various forms, and although they have several title variations, the photos themselves remain remarkably consistent. Calfee’s first series would seem to be his green mount views. They are all titled and numbered on the front. This green series had at least two printings with different reverse styles. 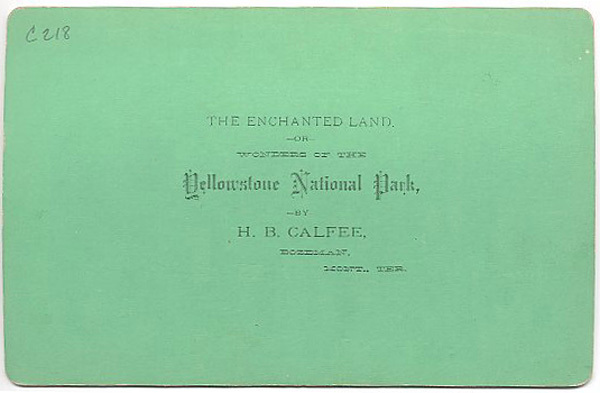 One was the set entitled "The Enchanted Land or Wonders of the Yellowstone National Park." The other stated, "Views in the Wonderland, or Yellowstone National Park." This second title would remain on several Calfee sets. This series appeared again in another printing with Brown Colored mounts and the "Wonderland" reverse. His second series would be issued on Yellow Mounts. 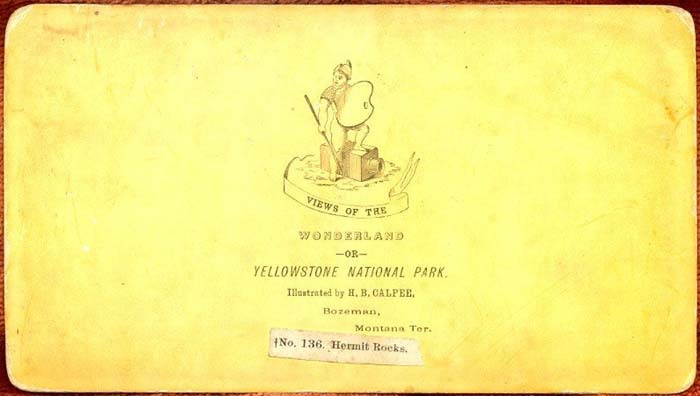 Still titled, "Views in the Wonderland, or Yellowstone National Park," this series had a new reverse showing a man holding an artists palette and standing on a box camera. It had essentially the same viewlist as the first series, but the titles were varied and shown in strips on the reverse side. Still later, views credited to Calfee and Catlin all appear to be reprintings of this series. Calfee also issued a set of unmarked views on Orange Mounts and another on Beige. The origin of these sets is unknown, they are more scarce than the views mentioned above. No. 226. 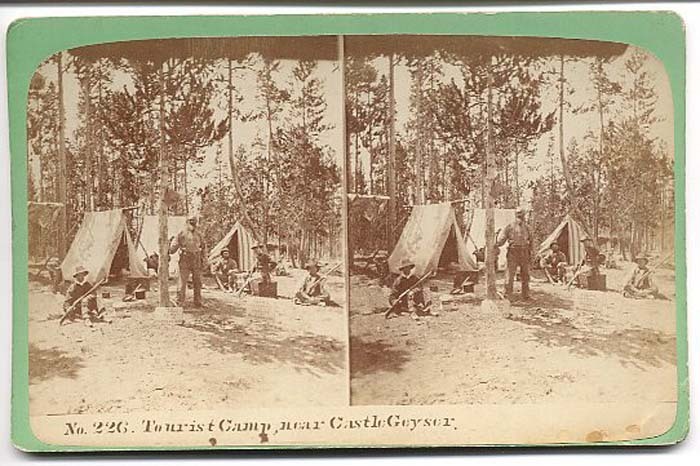 Tourist Camp, near Castle Geyser. Calfee’s most common style, this view likely shows Calfee himself leaning against the tree. Calfee's two green reverse styles. These are from the first series he issued. No. 59. Upper Falls, Yellowstone. Calfee's Brown Mount series, appears to be identical to the green. Since they seem to be more scarce, they are possibly a subset. No. 45. Cascade Falls, East Gardner River, 85 feet fall. Untitled view of Mammoth Terrace. Calfee's untitled views may be his earliest of all. They don't appear to be associated with any of his series. No. 13. 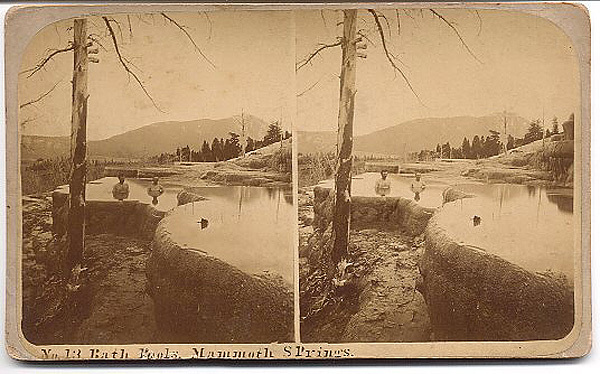 Bath Pools, Mammoth Springs. The obverse of the Calfee & Catlin views do not have any distinct difference from those crediting Calfee alone. Calfee & Catlin views are probably the latest of his sets. Issued on brown or yellow mounts, two reverse styles are shown here.